Well, what have we here? Whoosh! If you want to get up the next morning - better not book 'em! This is a Ceilidh band in the front rank of the bands on the English Ceilidh scene. Evolving out of the country dances of the British Isles, Europe and America, the style of dancing is typified by its exuberance and their music has all the energy and style that it takes to fill a floor with hundreds of delighted - if somewhat sweaty - dancers. 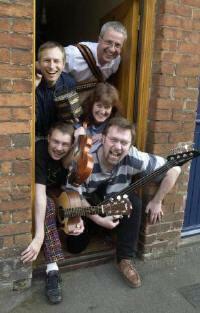 This ceilidh band have been regularly bringing their exciting music to major folk festivals including Sidmouth, Towersey, Warwick, Whitby... and many others.